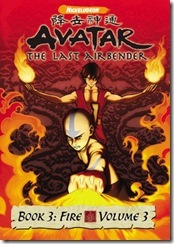 Avatar- The End is Near! The first question from the audience revealed that there is no "Air" book, and that the entire series was always designed to be a trilogy. They also stated that the Avatar world is still ripe for exploration, and that even though the story is ending, there are still tales that the two want to tell in the Avatar world. As a result, there may be some questions left unanswered (such as some information about Uncle Iroh's past), but that they're not done with the world yet (Toon Zone). It is upsetting to think that this amazing series will soon be over. I am a bit confused by some of the stories that I have seen about the upcoming episodes. Some reports say that there are only 4 new episodes coming. If that is true. Book 3 would be the shorts of the 3 seasons. There have been 10 episodes so far. Season 1 had 20, season 2 had 16. Since the series is supposed to return on April 30 and will run to July, the idea that they would stretch 4 episodes over that time seems to be a little thin. Not to mention, how are they going to tie up the Zuko amd Iroh storylines in such a short time. I cannot wait for the show to come back, and I cannot wait to see what happens after the fall of the Fire Lord.